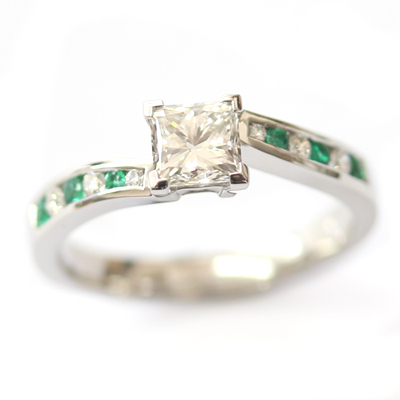 Platinum Princess Cut Diamond and Emerald Engagement Ring — Form Bespoke Jewellers Ltd.
A bespoke engagement ring with diamonds and emeralds. At the centre of this colour engagement ring is a a bold princess cut diamonds which has been hand set in four v-claws. This frames the diamond beautifully. Similarly, the stones in the shoulders of the ring have been neatly framed too. Channel set down both shoulders are alternating round brilliant cut diamonds and emeralds. A lovely, colourful feature. The customer chose for their bespoke design to be cast in platinum which compliments the colour scheme perfectly.